What do you do when you visit a site and can't find the information that you're looking for OR if the information presented is stale and dull? That's why it's essential that you present useful, informative and entertaining content on your own site and basically, there are 6 ways to develop content for your site, which I've listed below in order of preference. You'll also find recommended reading and tools below that will help you learn to write and source content on the web. I've personally written 90% or more of the copy on all my sites. And yes, all that writing takes time, but when you're writing about things that are near and dear to your heart, it's not work – it's FUN! Better yet, strong personal endorsements ALWAYS convert better than merchant copy. Occasionally, when I've been in a hurry to ‘get the word' out, I've used merchant copy. However, I always get permission to revise the copy first to avoid the potential of duplicate content penalties. You don't have to write all your material, either. Consider doing a telephone interview with an expert in your niche and then have that interview transcribed. If you think that your writing lacks luster or you find that it's a real grind, here's a tip… writing well really isn't that difficult. Can you tell a friend about a product or service that you like? If you can, then all you need to do is pretend that you're talking to a friend and and type what you would say to them. If you really don't want to write, then hiring a ghostwriter is a great alternative. Many webmasters build content for their sites quickly and cheaply using ghostwriters hired through Freelancer. Some have articles written for as little as $2 a piece, but remember, you do get what you pay for. I suggest spending a minimum of $10 per article to get reasonable quality content — and I've spent as much as $100 to have a magazine quality article written. HATE to write? No problem! You can buy private label rights articles for your site. Niche content packages and private label rights have become all the rage of late with webmasters who either hate to write or don't have the time to write. Learn how to use and profit from private label rights, and check out this list of recommended “PLR” distributors. Want to create your own ebook… easily? Then consider using a public domain work. Public domain works, eg. books, poems and articles have NO copyright protection. Anyone (me, you, anyone) can copy, modify and sell them. Better yet, you can even remove the original author's name and treat it as your own. Moreover, once you modify a public domain work it becomes your property. The modified work receives an automatic copyright just like it would if it were an original work. Using merchant copy is the option of last resort. Your visitors have seen that ad so many times before they get to your site, that when they see it again, they'll just click away. Moreover, you will run the risk of incurring a duplicate content penalty from Google. For a truly successful site, use one of the options listed above. It is possible to reprint articles posted on article directories such as GoArticles.com and EzineArticles.com provided you respect the author's copyright guidelines and restrictions for use. Although I personally recommend AGAINST using other authors' material because your site will bleed traffic through those author links, there's no harm in using them to build content and traffic initially. Thanks Rosalind, have been having issues on how to build content on a blog as a starter. Great resource. Does registering my URL in profiles of directories and blogs I leave comments on actually increase my website’s ranking…or do the blog readers have to actually click my link and visit my site to credit me with the backlink? I run a few affiliate sites and I’ve had good luck using ODesk to hire cheap writers for $1 per page. It’s not Shakespeare but it’s good enough for affiliate purposes. Just make sure to do your keyword research first. It’s huge! Map out your keyword structure for your site and identify which keyword are relevant to which pages. Thank you so much!It is very informative,I will follow these tips. Thanks a lot for such valuable and useful informations. 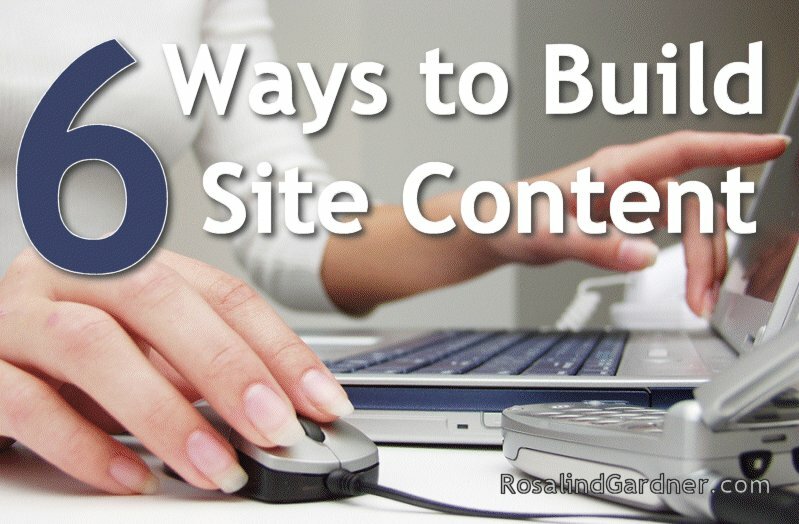 I’m staring to build my site content and this post is a great help. Keep posting resources like this! I love it. Excellent post! Thank you for helping newbies like me. Thank you for the list. I’ve already started to read the Pre-Sell pdf, and I’m wondering how I can make my blog posts more personal, useful, and entertaining. I’ve also been introduced to Gary Halbert’s style. Hope that will rub off on me! Thank you for your article. I’m just getting started building content for my site. So much to learn!